One of the really nice things about being a 21st century genealogist is the wide variety of opportunities to get to know people and to find out more about issues and concerns than ever before. The Legal Genealogist regularly listens in to podcasts and webinars and radio programs with the movers and shakers of our field, and with those many members of our community who know more than I do about a whole host of things. The Genealogy Guys podcast is always a good choice. Lisa Louise Cooke’s Genealogy Gems podcast is another. Internet radio offers Bernice Bennett in her Research at the National Archives & Beyond programs, and Marian Pierre-Louis in her wonderful Fieldstone Common conversations with authors of genealogy and history books. Looking at webinars, there’s the whole Legacy Family Tree series and terrific choices from societies like the Illinois State Genealogical Society and the Southern California Genealogical Society, just to name two. And on the video chat side of things, there’s Dear Myrtle’s Mondays with Myrt and, since October of last year, the Fireside Chats of Mocavo’s Chief Genealogical Officer Michael J. Leclerc. Michael’s guests have included Diane Gravel, CG, of New Hampshire, talking about New Hampshire research; Kelvin Meyers of Texas on forensic genealogy; Paula Stuart-Warren, CG, of Minnesota, on railroad records; Thomas MacEntee of Illinois on genealogy and social media; Cyndi Ingle of Washington on Cyndi’s List and more; and, today, The Legal Genealogist. 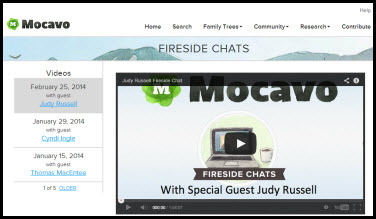 The whole conversation is online at the Mocavo Fireside Chat site and you’ll find all the archived chats with previous guests online there as well.